Free TV Services: What's the Real Cost to a Medical Office or Business? Free TV Services: What’s the Real Cost to a Medical Office or Business? and there’s no such thing as a free TV service. If you’re using a TV service or platform that’s free, sooner or later you’re going to feel the cost of it – even if you didn’t put a single cent down. Even a homemade slideshow, or video that only cost the time it took to make it can bring detriment in the long run. The structure of such a video or slideshow may stand out as unprofessional and tacky and do more harm than good. What’s the Cost of TV? Cost runs a little deeper than money. The initial cost of cable, for example, might be a some-hundred dollar subscription for an inclusive package – but that’s not all there is to it. There are many hidden costs of running cable in your business. The lack of program control, contributing to visitor anxiety or showing competitor ads all can harm your business. Everything has a cost, but not everything has a strong level of return. Cable is an expense that gives nothing back. Industry-specific TV providers, like the ones often seen in medical offices, benefit pharmaceutical companies while showcasing drug ads and medical information that tends to raise anxiety among patients. You can do better than free. 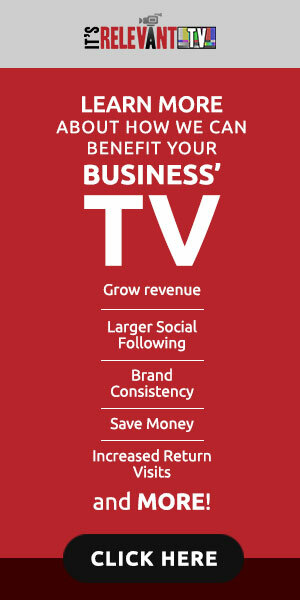 Business owners are moving away from paying for TV as a utility, and are instead putting It’s Relevant TV in place to generate revenue from their TVs. It’s Relevant is an alternative to cable that is less expensive, gives you control over what appears on your TV, and is comprised of short-form content that’s family-friendly and structured with business settings in mind. The service gives you access to a living TV network, not a loop or slideshow, that pulls videos from a vast library of licensed TV programs. It’s interesting and fun. The IRTV platform generates new revenue by promoting additional services, specials, and events that people might not have been aware of. The service represents a significant return on investment (ROI), and is focused on customer retention – getting customers to spend more, and come back more often. So while there is a monthly subscription cost, the value and benefits far outweigh it. For a personal look into how It’s Relevant can draw in more business for your business, check out our ROI Calculator and see for yourself how much of a return you can expect from our service.